Claas Van Der Linde sent us this drawing from the May 1920 Rudder Magazine comparing the size of RELIANCE to the Clipper Ship Flying Cloud. As you can see dainty RELIANCE stood taller!! 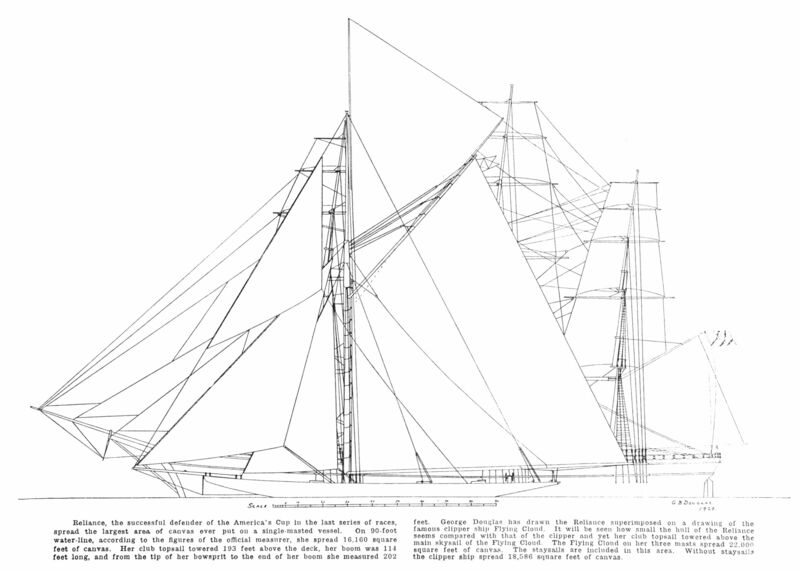 Flying Cloud was built to round Cape Horn, though, and RELIANCE was only built for fair summer days off Sandy Hook. This entry was posted in Builder's Notes & Pictures and tagged Flying Cloud, RELIANCE on March 28, 2013 by Herreshoff Marine Museum/America's Cup Hall of Fame.